An engagement in the online discussions around open source, Eclipse, and other random musings. In this post, we're going to walk through adding a simple content extension to the viewer we defined in the last example. To avoid getting bogged down in an overly complex content provider and label provider, we will focus on a file structure with a very simple model, in this case a plain old *.properties file. When finished, our content extension will allow us to expand any *.properties file in the Example viewer and render the data in the file right in the viewer. You may also download the full example as it stands at the end of this posting. First, let's take a look at what the content extension will look like in the plugin.xml file. If you have read the last post, you'll know that you can build an extension like the following example using the Extensions tab of the Plug-in Manifest Editor. First by selecting Add... on the Extensions page, choosing org.eclipse.ui.navigator.navigatorContent, then using the right-click menu, and following the New > navigatorContent menu path. Alternatively, you can create this extension in the plugin.xml tab of the same editor. Either approach is fine, but the first approach drives the New menu from the Extension Point Schema, so you will see other options that are available in the raw plugin.xml tab. The extension declares a content extension with the id "org.eclipse.ui.examples.navigator.propertiesContent" with the display name "Properties File Contents". The name is the string used in the "Available Extensions" tab of the Filters dialog. * We will get into the code for the content and label providers shortly, but for now just note that each are specified; you cannot specify just one or the other. Finally we set some attributes to tell the framework how we would like our extension rendered in the viewer. activeByDefault determines whether the extension should be active in the default configuration (e.g. new workspace). priority is used in a couple of different ways. The most prominent is to determine the relative ordering of items in the viewer (highest priority items towards the top of the viewer down to lowest priority items towards the bottom of the viewer). In general, either "normal" or "high" should be sufficient for most extensions, indicating that they should be mixed in with the resources extension (when priorities match, the label is used to sort items alphabetically) or placed just above resources under projects. Within each <navigatorContent /> element, we can specify many different types of extensions, but before we grow the example, we must describe to the framework when our extension should be invoked. We need to describe when we can provide children, parents, or labels and icons for nodes in the tree. We do this using Eclipse Core Expressions. For now, I'll refer you to the documentation for org.eclipse.core.expressions for more detail on what is possible with these, or you can use the New > ... menu in the Extensions tab to create these easily. For content extensions, there are two important expressions: <triggerPoints /> and <possibleChildren />. The <triggerPoints /> expression indiciates which types of nodes in the tree might be interesting to our extension. When the framework finds a node that matches the <triggerPoints /gt; expression, our extension will be invoked to provide elements or children for that node. Our extension may not be the only one to be given the opportunity to provide children, as the framework will aggregate all contributed children under each node. The <possibleChildren /> expression indiciates which types of nodes in the tree our extension may be able to provide a label or parent for. For your scenarios that must support link with editor, or setSelection() on the viewer, the <possibleChildren /> expression must be accurate and complete. Once we have an extension defined, we must bind it to the viewers we want it associated with. Specifying a <viewerContentBinding /> indicates that any extension which matches an included pattern is visible to any viewer with the viewerId specified in the <viewerContentBinding /> element. Recall that we saw these in the last posting. For the example, we will bind our properties content extension (with id "org.eclipse.ui.examples.navigator.propertiesContent" to our Example View (with id "org.eclipse.ui.examples.navigator.view"). Now that we have setup our extension, let's take a look at the code that will actually do the heavy lifting. First, we need a model. A properties file has an extremely simple structure, and we will model this using just one type of model object, called PropertiesTreeData, which will have three fields: name (the name of the property), value (the value of the property), and container (the file that contains the properties model. One of these model elements will be populated for each property in the *.properties file. 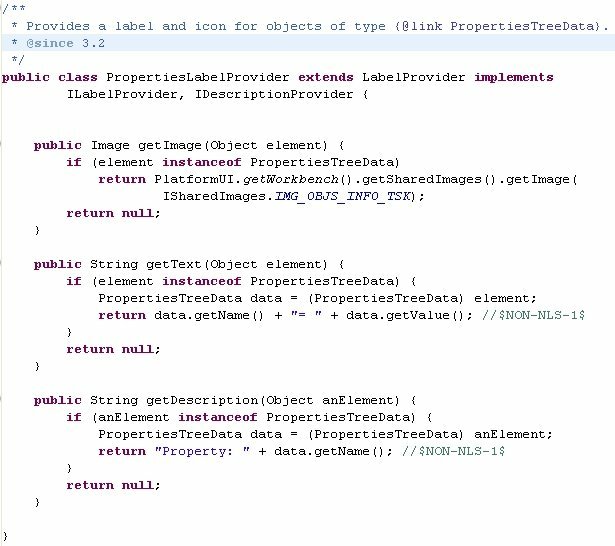 In our example, the properties model will only be loaded when requested through the content provider. The content provider is used by the framework to determine the children of each element in the tree, or for any given element, determine its parent (or parents as there could be potentially more than one). Our example content provider implements org.eclipse.jface.viewers.ITreeContentProvider to provide information about the tree structure. The Common Navigator framework also supports implementations of the new org.eclipse.jface.viewers.ITreePathContentProvider, but that is out of scope for this example. The PropertiesContentProvider also handles some of the other functions required by our extension, such as listening for resource changes and updating the model (and viewer) accordingly. We will not go over these in this posting, but you can see how it works in the full source. For now, we will focus on the viewer integration methods as defined by ITreeContentProvider. An ITreeContentProvider must implement getElements(Object input), getChildren(Object parent), hasChildren(Object element) and getParent(Object element). The getElements() method is queried for elements at the root of the viewer. Many implementations will just forward this call to getChildren(), and that's just what we'll do. The getChildren() accepts an object (in our case either a *.properties IFile or an instance of our PropertiesTreeData model object because we described these in our <triggerPoints /> expression. In the following implementation, we check to see if the incoming element is an instance of org.eclipse.core.resources.IFile and if the file extension ends in *.properties. If the incoming element meets these criteria, we check our cache of loaded models or attempt to load the model if not cached. The method updateModel() will create a PropertiesTreeData object for each property, and cache what it finds in the cachedModelMap. Check out the full source to see how updateModel() is implemented. The hasChildren() method is optimized to return true whenever it is called with an IFile with the *.properties extension. The other alternative is to eagerly load the contents of the file to perform the calculation, but that approach comes with an added performance penality. If called with a PropertiesTreeData model element, hasChildren() will return false, since none of our model elements may have children (a property has no children, but other models clearly may). The getParent() method will return the IFile that contains the PropertiesTreeData item or null if called with any other object. The Common Navigator framework will continue querying other extensions until a non-null parent is found or all relevant extensions have been queried. Recall that an extension may be asked to provide a parent for an element if that element matches its <possibleChildren /> expression. Finally, the label provider of our content extension tells the viewer how to render the icon and label for our model elements (PropertiesTreeData). Since we're only conerned with these elements, we do not need to worry about providing labels or icons for any other elements. Other extensions will render the labels and icons for other elements in the tree. The PropertiesLabelProvider implements org.eclipse.jface.viewers.ILabelProvider and also org.eclipse.ui.navigator.IDescriptionProvider. ILabelProvider is the default interface required for proving labels and icons by JFace. 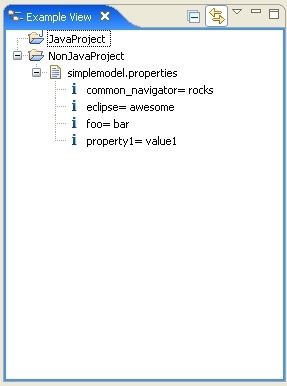 IDescriptionProvider is specific to the Common Navigator framework and is used to provide text for the status bar in the lower left hand corner of the Eclipse window. The methods required by ILabelProvider are getText() and getImage(). We will render the label for our model elements as the "name= value" string for the property (without the quotes). For the icon, we just use one of the shared icons provided by Platform/UI. The label provider will be queried for labels, icons, or descriptions for any element contributed directly by the extension or for any element that matches the <possibleChildren /> expression for that extension. If null is returned for the icon or the label, the framework will continuing other applicable extensions based on their <possibleChildren /> expressions and viewer bindings. If your extensions wishes to pass on its opportunity to provide a label or icon, always return null. And that's it. The final view renders properties files right in our Example View. *-In general, you should externalize your strings, but we will not worry about that for these examples. Why would scribbledideas be interesting to read?